Mons Kallentoft is a writer who divides his readers. 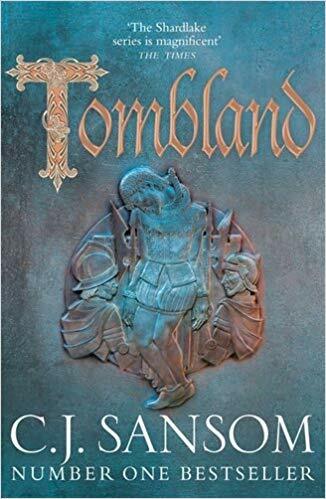 I’ve reviewed all the books that have been translated into English on this blog and many of the comments, either here or on other reviewers’ sites, suggest that not everyone enjoys Kallentoft’s unusual style of prose. 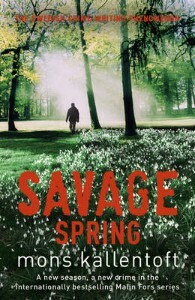 But the series has become one of my ‘must reads’ and I think that the latest book Savage Spring is one of his best. In the main square of Linköping in Sweden, an explosion outside a bank kills six-year-old twin girls and their mother is seriously injured in the blast. Detective Inspector Malin Fors is called to the scene from her mother’s funeral and like the rest of the team is shocked by the apparently meaningless atrocity. The pain of her estrangement from her own mother, which has its roots in her loveless upbringing, has to be put aside to bring justice for the two girls. However, Malin’s newly acquired sobriety is put to the test by the stresses of the case, family relationships and revelations from the past. Much of the previous book, Autumn Killing, was taken up with Malin’s descent into alcoholism which culminated in her being admitted into rehab. In Savage Spring, Malin is struggling to stay sober although the lure of drink is forever in her thoughts. The passages involving Malin’s mental state are written with a lighter touch in this book and worked much better alongside the murder investigation. Kallentoft is excellent at showing the long-term impact of alcoholism on a family and even ex-partners who look for new relationships that distance themselves from the past. We also get an insight into why Malin has such a destructive personality and family secrets that remain hidden for decades. These themes resonate with the investigation into the girls’ killing which is bound up with family and dysfunctional relationships. The murders are fairly difficult to read about as it involves small children, although interestingly it’s not always clear who is the abuser and the abused. As we have come to expect from Kallentoft’s books, we get the voices of the dead, this time those of the two little girls. I thought it worked well here, perhaps because it added to the sense of loss although I appreciate that it’s not to everyone’s taste. The disjointed narrative is also a characteristic of the writer and one of reasons I enjoy the books so much. The fractured nature of the writing echoes both the plot and the characterisation and unsettles the reader to the conclusion. Savage Spring is probably my favourite in the series to date and suggests the books are getting stronger with each new offering. I’d still like a resolution of the case that has been preoccupying Malin since the first book, Midwinter Sacrifice, but it seems that we are going to have to wait for this. Thanks to Hodder for my copy of the book. The author’s website is here. The translation, as always excellent, was by Neil Smith. You’ve given me my first laugh of the morning Bernadette. And wouldn’t the world be boring if we all liked the same thing? This one really is very good. I don’t know this writer but I’m prepared to give him a go. If I have difficulty getting the books is it necessary to start at the beginning of the series or can I dive in anywhere? Hi Alex thanks for commenting. You can easily read any of the books as a standalone but I think either book 1 ‘Midwinter Sacrifice’ or this one might be a good place to start. I’m adding your own blog to my feed. Given that you like to think in fragments this might be the book for you! Thanks Margot. I think his narrative style is innovative and as you say it’s nice to read something different. I may try this one too thanks to your excellent review, Sarah. The voices from the dead aspect worked well here. I hope you enjoy the book if you try it! I picked up one of Kallentoft’s books at a book swap event a few months ago. I’d never heard of him before but was pleased to find a new-to-me Scandinavian crime novelist. I haven’t read it yet and can’t remember which it is – does the series need to be read in order? Your review has made me even more interested, particularly on reading the mixed opinions in the comments. I don’t think you need to read the books in order at all Marie. I’ll look forward to the review…. I know nothing about this author, and now I will have to try one of his books. I will put him on my book sale list. Great Tracy. Look forward to the review. Another maybe here. I like the idea that the author seems to have the marmite effect! It may well be worth a look to see which side of the fence I come down on. One to definitely try Col. I have a feeling you’ll like him based on your reviews of other books. What endears me to a new author is his or her “unusual style of prose” and I wouldn’t mind Kallentoft’s work. Sarah, generally speaking, would you say that modern-day writers of crime fiction are focusing more (or equally) on the lives of their lead characters rather than on the crimes they are supposed to investigate, perhaps to make them seem as realisitic as possible? For instance, would Malin Fors have been any less appealing if she hadn’t been an alcoholic with a (self) destructive personality? Many thanks. Interesting question Prashant. There is so much crime fiction out there that I think the truly memorable books are the ones with excellent characters. So I suppose there is a greater emphasis on strong characterisation now. But I personally need a pretty decent plot too. So it’s great when the two come together. Just started reading “Summer Death” which is a difficult read – present tense, which is loathe, and a poor translation. Neil Smith uses a lot of British words or simply ancient words from an old Swedish-British dictionary. Is this to make us think we are reading a Swedish story? But these days, Swedes are more affluent in American English than British. I wish the American edition of “Summer Death” had replaced “mum” with “mom”, “flat” with “apartment”, “adverts” with “ads”, and so on. And IKEA is not a “warehouse”!